Implants are surgically placed in your jawbone, potentially altering or preventing further loss of bone and gum and rebuilding your natural face shape. 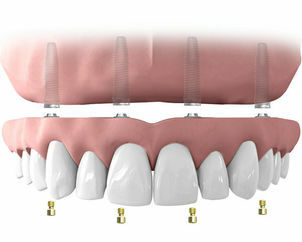 Implants provide a solid foundation for affixing the denture or bridge, this added security restores your confidence to smile. 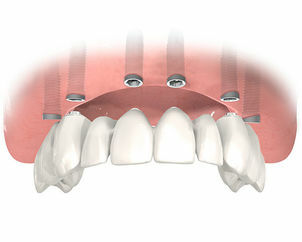 The denture or bridge is fixed into place with screws, giving your new teeth a more permanent and natural feel.